You're buried. You have impending deadlines, projects to manage, and new ones to implement. What you need are some extra hands. Managed services are the extra help that will save your day. With managed services, you'll be free from essential, necessary, but time-consuming tasks. Tasks like monitoring and managing your IT infrastructure. You'll be free to focus the right people and resources on the proper projects. Your strategic initiatives will fall into place all while increasing efficiency and productivity. We understand that not all managed services are created equally. We understand your circumstances are unique to you. We understand that you need more than just extra pair of hands. You also need the knowledge and experience. That’s why at REAL, more than 65% of our total staff are engineers. With REAL's managed services, you get a full-service IT solution that includes the best certified experts in the industry, 24/7 helpdesk support, SSAE 16 compliant, tested and proven ITIL best practices in IT managed hosting and world-class technology. All of this is wrapped in a high availability service level agreement that financially guarantees your satisfaction. Our managed services remove the hassle of managing your own servers and services. We effectively become an extension of your company’s IT department. With REAL, you can leverage the latest technology without having to worry about hardware or any of the headaches associated with maintaining computer systems. This means less overhead and a larger return on your IT investment. Our goal is to be a strategic partner with all of our clients. We believe that the formation of partnerships with unique products and services is essential to our goal of providing the absolute best services, solutions, and expertise to our clients. A Managed Service Provider that can move fast when they need to go quickly and change direction if required. A strong component of every business model. A MSP that can provide end-to-end services to meet their specific requirements, so they do not have to manage multiple vendors. A record of past performance, competency, and satisfied clients. A professional, well-trained, competent IT staff that can be trusted using proven processes and advanced IT toolsets with many trusted certifications from latest industry level technologies. Provided by the same Managed Service Provider that provides patching, maintenance, and upgrades. This leadership that can participate in Board level meetings to connect business goals and objectives with IT strategy and tactics. REAL provides Proactive Managed IT Services by designing, implementing, operating, managing, and monitoring all types of IT networks, devices, and users. For a fixed monthly fee, we provide many Managed IT Services such as Mobile Device Management (MDM), storage and cloud solutions, VoIP services, on-site/remote support, 24×7 Help Desk Services, Complete IT Security, dedicated support, and much more. Keep pace with your competitors and focus your IT teams on projects that move your business forward! REAL's 24×7 Help Desk Support provides responsive user support, management, and reporting from trained service desk specialists. You gain access to a significant investment in IT monitoring and management platforms when you leverage our Help Desk Support Services. Organizations avoid spending time and resources on training, support costs, and expensive trouble ticket service management (ITSM) systems. Our 24×7 Remote IT Monitoring and Management (RIMM) services support your IT assets across the business for a fixed monthly fee. Different than most Managed Service Providers (MSP), REAL does not operate in a break/fix support environment that is unpredictable and unsustainable. Your assigned Client Service Advisor monitors and supports your systems 24×7, and proactively manages your IT infrastructure with security policy administration, backup management, event log monitoring, patch management, server and availability monitoring, and IT asset inventory. We leverages industry best ITIL-based practices, tools, and methodologies to manage your IT infrastructure and devices at the highest level of performance and reliability. We deliver an advanced Service Management solution paired with customized Service Level Agreements (SLA’s) designed to meet your specific needs. We provide intuitive incident reporting via email or phone. We rely on 24×7 monitoring and management of IT systems to identify recurring problems for remediation and mitigate incidents. Protecting your network from security breaches – both internal and external – is mission critical for companies today. The risks are serious, and could be disastrous for your business. With our background in Cyber Security, REAL understands how to implement secure networks with the latest in alarm monitoring and security controls to help you keep your business running smoothly and safely. We provide reports and spreadsheets quarterly to show the progression of our help to you and your business on keeping the network completely secure. Our consulting team is well versed in innovative IT strategies and planning, specializing in evolving businesses, advancing technologies, and forward thinking IT infrastructure. We assign a lead technical engineer to provide insight into different technologies and solutions, and how to improve your business. You benefit from a partner-based savings plan, and we offer a scalable solution to help you manage incoming staff at no extra cost. We are engaged in your business to better support it. REAL's virtual CIO includes a complete management services package designed to lead your IT efforts and take responsibility for your IT strategies and investments. You work with a senior level IT executive that is familiar with leveraging technology to reach your business goals. In just a single meeting, you benefit from our longstanding experience operating in diverse IT environments. We manage and participate in performance accountability, business review meetings, IT strategy assessments and recommendations, technology roadmaps, policy review, and advisory services. Can your current IT Provider keep up? Does your current IT Provider focus on only one or two IT components? REAL offers an “end-to-end” IT solution. Service Level Agreements (SLA) outlining performance criteria are meaningless when multiple vendors are involved. Legacy systems exist and are quickly becoming obsolete and harder to support. Growth of your data is increasing, and your IT infrastructure cannot keep up. The number of sites, devices, systems and users is increasing. As everything is growing so is your ability to manage risk, security, and compliance. Finance wants to move from a capital to an operating expense model. Maintenance is burdensome and licensing, and support contracts are becoming problems. Existing IT infrastructure is fragmented and becoming more complex to manage and monitor. If you accept that data is critical to your business and that the management of that data is equally important, then you want to establish a relationship with a provider like REAL that will be a managed it services “partner” with you, and not a faceless vendor who just sells a commodity solution just to get a kickback in the end. Remember! Our focus is to change how everyone views IT companies. Allow us to show you how we are the REAL difference! Visibility – Being able to find, identify, and see 'into' all of the devices on your network in real-time. Control – Assessing the situation and have the staff, skills, and tools to react and respond. There has been many articles written about threats and tools but the bottom line is focusing on being able to detect something questionable happening and then quickly remediate the problem. At a very minimum, you must have mandatory tools like virus protection, intrusion protection, and intrusion detection in place. 25% of users open phishing emails and 11% of them open the attachments. Attacks can target ANYTHING! Hardware, firmware, BYOD devices, Internet of Things and through API’s, wearables, employee systems, cloud services, and even directly target employees. Employee targeting includes malware, Ransomware, and denial of services attacks. Simple human error creating IT Security 'holes' helps open a door to an attack. 94% of businesses will be attacked or incur some cyber security issues every year. It will happen. So get prepared. REAL can help. It makes sense to have your Managed Service Provider also provide you IT security services on the devices they already manage. In 60% of investigated scenerios, attackers compromise the company within minutes. As sophisticated as IT breaches have become, some of the most practical solutions are quite simple. However, these solutions require constant attention and monitoring of employees, devices, and IT systems. The problem is companies have IT staff fixing IT infrastructure problems, end-user issues, and working on internal projects. Without an 'eyes-on' approach by skilled IT security professionals, you are leaving your company vulnerable to IT security breaches. Most companies that get breached aren’t aware it has happened. The sophisticated attacker does not want you to know that they have accessed or are altering your data. The median time to discover a breach is typically measured in months. 65% of all attackers reported, are insiders. Either malicious or inadvertent users. Should a breach occur, most organizations are embarrassed to have customers or law enforcement inform them of a violation. Well-prepared companies have a breach response plan outlined and tested. Can My Business Protect Itself? 40% of Spam attacks spread from the first victim to the second within 6 hours or less. No matter how much money you spend on intrusion prevention, there are always vulnerabilities and zero-day exploits waiting to be utilized. Look into hacked articles about Sony, Verizon, Home Depot, Myspace, Yahoo, and Target. More than half of the attacks are carried out by insiders, and most of those are malicious and intentional. If you are going to invest in cyber defenses, make certain to incorporate early detection of anomalies, including those which could originate from your staff. We have dealt with several of these situations. One of the best ways to protect yourself is to work with a Managed Service Provider, with a Security focus like REAL. Our experience in managing thousands of devices gives us the knowledge to apply the appropriate security software and devices to give you the protection you need. Companies look to us for ongoing guidance, not to sell them tools. We meet regularly with our clients to assess and discuss how they can be more secure. We provide current awareness of trends we see with other clients as well as emerging threats. 80% of legitmate websites have unpatched vulnerabilities. The IT environment continues to expand and change. Broad and complicated attack tactics. Compromised credentials and broken authentication. Perpetrating breaches is getting easier. Hackers only need to find one crack in your IT Security Wall. Hacked API’s (many API interfaces are open). Lack of knowledge and skills of your IT staff. At REAL we tailor our solutions to fit your needs. You may have existing security platforms and systems, and we will work with them (If they aren't insecure within themselves). Example 1 - Companies that use Norton and McAfee anti-virus products tend to still have malware present on their systems and networks. There could be multiple of reasons, such as, improper configuration of policies or corrupt installations, but for us to give you the best security that is required, there may have to be some changes put in place. Example 2 - for our customers handling credit card data and must adhere to Payment Card Industry regulations. Because of this, we perform the daily log review required by the PCI Data Security Standard section 10.6. Our security professionals can provide an assessment and design a customized solution to fit your unique situation. How can REAL's IT Security Services Protect Me? Less than 10% is the initial detection rate for a newly created virus. Majority of companies do not have a Chief Information Security Officer. We become their virtual CISO. For the CISO, the scarcest resource, even for those organizations with larger budgets, is often skilled security staff. Due to this scarcity, they often make compromises on their security posture and find it hard to take on new security initiatives. They just can’t keep up with all of the quickly evolving threats and changing array of security protection tools. REAL provides experienced security practitioners, so busy CISOs or companies without CISOs, can keep up with new threats and government compliance requirements. Engaging our “Security as a Service” model is very simple and allows a firm to budget a fixed operating expense for outsourced security experts, as well as security solutions that would otherwise require hardware and software outlays. What REAL Security Services can do for your company! The REAL Managed Security Services extends your IT teams capacity to protect applications, computing, and network infrastructure with advanced security solutions that are easy to implement, fully managed, and do not require large upfront investments. REAL’s Managed Security Services removes the burden of around-the-clock monitoring from organization’s already taxed internal IT staff. Our 'Layered' approach to IT Security Protection offers you complete protection for your users and your entire IT infrastructure. 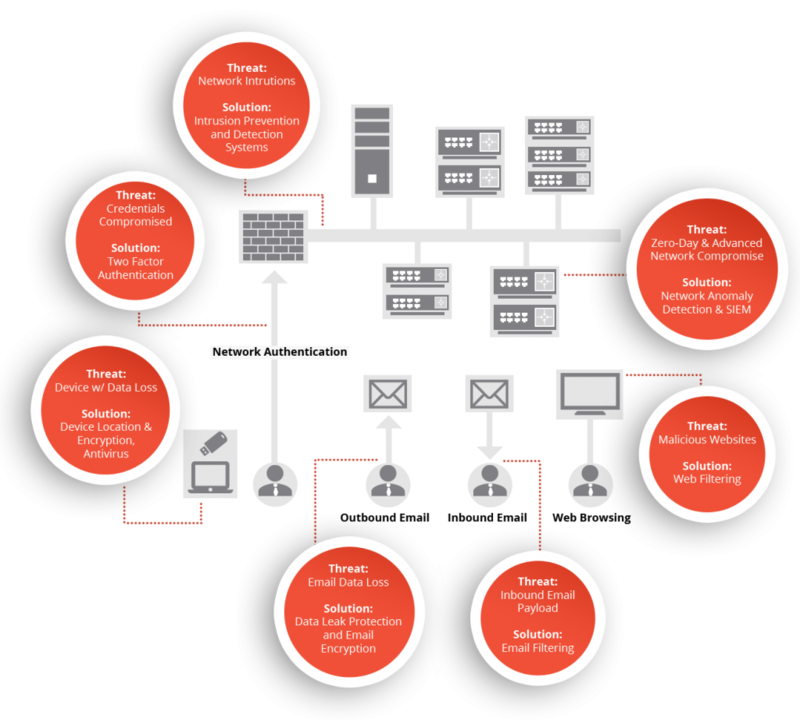 Each 'layer' works with the others to provide IT Security protection for your organization. The challenge of finding, retaining, and training skilled IT security staff - coupled with the high cost of purchasing and maintaining security software, and hardware technology in-house - puts IT security protection out of reach for many organizations. Additionally, if your “core focus” is not that of an IT security organization you are accepting a huge element of risk when “fielding your own teams”. The diagram below represents all of the layers protected by REAL IT Security Services. REAL understands that maintenance is more than a contract for hardware support. We believe that maintenance is only one part of an ecosystem of service necessary to ensure that your IT systems and software are running at their best and backed by a suite of capabilities to keep them running at their optimum. Our Proactive IT Maintenance Service to optimize and prevent system problems in our client’s equipment. This helps avoid equipment failures and expensive, untimely repairs. Our Professional Engineers maintain your IT systems, so you have more time to focus on your core business. Network Maintenance on LAN and WAN devices. Virtual Private Network (VPN) Between Offices. Cisco Voice Over IP maintenance. Optimizing Hardware and Software Performance. Better management of reporting and assets. The idea to start REAL Solutions Technologies (REAL) originated after multiple requests for a trustworthy and reliable technology company. With over 15 years of experience, REAL will change the way the public thinks about IT companies. With REAL having a strong background in Cyber Security, our clients benefit by having top level security protocols implemented in all their services and projects.